Superior Trunk Nerve Block (STNB) is a novel approach to block all five nerves supplying the shoulder joint by accessing the superior trunk of the brachial plexus using ultrasound guidance. This procedure targets the C5 and C6 components of the brachial plexus more distally from the interscalene groove after they unite into the superior trunk but before the suprascapular nerve branches off. This is normally less than 1.5 cm from the skin in the lower neck which is easily visible and reduces the risks. This procedure is carried out by Anaesthetist or Pain Consultant. Shoulder pain is a major cause of morbidity and disability in the general population. Musculoskeletal (MSK) pain is a major reason for a consultation and loss of working days in the current healthcare setting .Incidence of certain MSK problems are rising especially in view of aging population. Shoulder pain in combination with neck pain is the second commonest and in isolation it is the third commonest problem affecting the musculoskeletal system . Incidence of post stroke shoulder pain is reported as high as 70-80%. It is putting a lot of pressure on the health and social care. Current treatment includes analgesia, physiotherapy, surgery and suprascapular nerve block (SSNB) in isolation or in combination . However, treatment is only partially successful normally due to multiple aetiology and poor compliance. In addition, many people with chronic shoulder pain are not suitable for surgery due to other co-morbidities and have difficulty tolerating analgesia. The conventional SSNB treatment for chronic shoulder pain is done blindly, x ray guided or ultrasound guided. But it carries higher risk of pneumothorax and high failure rate. Furthermore, the SSNB procedure blocks only one nerve out of five nerves supplying the shoulder joint, it is hypothesized that STNB blocks all the five nerves supplying the shoulder joint.However, there are no published literature on efficacy of STNB against existing interventions. In the image below, dissection of the right brachial plexus above the clavicle has been shown. The image is used with permission from Dr. Ki Jinn Chin from their published article. 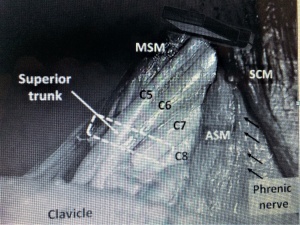 The conventional interscalene block done under ultrasound guidance targets C5 and C6 roots in the interscalene groove between the middle scalene muscle (MSM) and the anterior scalene muscle (ASM), just distal to where they emerge from under the sternocleidomastoid muscle (SCM). Superior trunk is formed more distally, the C5 and C6 roots rise out of the groove and unite to form superior trunk.The probe image indicates the probe locations for the conventional interscalene block and the dotted line indicates the probe location for superior trunk block. The procedure is carried out in theater by a Pain Consultant or Anaesthetist. The patient is in Supine position and the local anesthetic (+/- steroid) is injected in the neck region to the superior trunk under Ultrasound guidance. It is a day procedure and after few hours patient is discharged. This technique can be combined with neuromodulation or neurostimulation to achieve better clinical outcome. Post procedure targeted physiotherapy can be started immediately to maximise the benefit of the STNB in outpatient setting, it is not clear if post procedure physiotherapy is helpful in optimising in pain relief for long duration. ↑ Badcock LJ, Lewis M, Hay EM, Croft PR. Consultation and the outcome of shoulder-neck pain: a cohort study in the population. The Journal of rheumatology. 2003 Dec 1;30(12):2694-9. ↑ Parsons S, Breen A, Foster NE, Letley L, Pincus T, Vogel S, Underwood M. Prevalence and comparative troublesomeness by age of musculoskeletal pain in different body locations. Family practice. 2007 Jun 29;24(4):308-16. ↑ Bot SD, Van der Waal JM, Terwee CB, Van der Windt DA, Schellevis FG, Bouter LM, Dekker J. Incidence and prevalence of complaints of the neck and upper extremity in general practice. Annals of the rheumatic diseases. 2005 Jan 1;64(1):118-23. ↑ Croft P, Pope D, Silman A. The clinical course of shoulder pain: prospective cohort study in primary care. Primary Care Rheumatology Society Shoulder Study Group. BMJ: British Medical Journal. 1996 Sep 7;313(7057):601. ↑ Leung J, Moseley A, Fereday S, Jones T, Fairbairn T, Wyndham S. The prevalence and characteristics of shoulder pain after traumatic brain injury. Clinical Rehabilitation. 2007 Feb;21(2):171-81. ↑ Colen S, Geervliet P, Haverkamp D, Van Den Bekerom M. Intra-articular infiltration therapy for patients with glenohumeral osteoarthritis. a systematic review of the literature. Osteoarthritis and Cartilage. 2014 Apr 1;22:S399. ↑ Arroll B, Goodyear-Smith F. Corticosteroid injections for painful shoulder: a meta-analysis. Br J Gen Pract. 2005 Mar 1;55(512):224-8. ↑ Page MJ, Green S, Kramer S, Johnston RV, McBain B, Chau M, Buchbinder R. Manual therapy and exercise for adhesive capsulitis (frozen shoulder). The Cochrane Library. 2014 Aug 26. ↑ Laurent DB, Chan V, Chin KJ. Refining the ultrasound-guided interscalene brachial plexus block: the superior trunk approach. Canadian Journal of Anesthesia/Journal canadien d'anesthésie. 2014 Dec 1;61(12):1098-102.